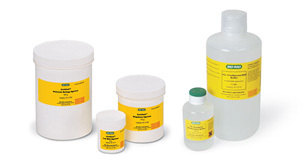 Nucleic acid electrophoresis buffers and reagents are available as individual reagents or as premixed buffers. Products include agarose powders and buffers for sample loading, gel casting, and electrophoresis. Bio-Rad offers seven different Certified Agarose products that are all guaranteed to be free of inhibitors, DNases, and RNases. Save preparation time and standardize your electrophoresis runs with premixed electrophoresis running buffers. They can be used with handcast or precast gels.